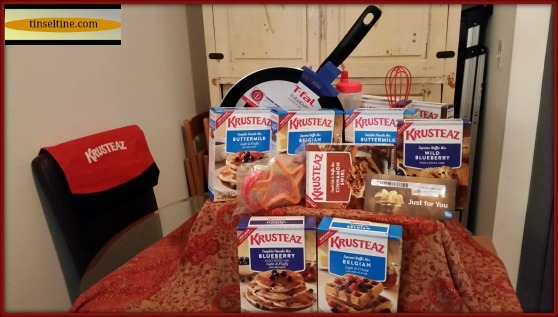 Win a Krusteaz #BreakfastNight Prize Pack! When someone says would you like to be sent pancakes, blueberry muffins, cinnamon crumb cake mixes, gift card for side dishes and a selfie stick, you just say YES Please! The big, new, non-stick pan from T-Fal Cookware was a total surprise! I also signed on to participate, as I've always been an proponent of breakfast for dinner for as long as I can remember, I feel like mentally, I was part of McDonald's being swayed to serve breakfast all day. So I love this #BreakfastNight promo which basically is like "Hey, fixing dinner every night is a hassle and a stress, but fixing breakfast is a lot less so, especially with the good and easy mixes made by Krusteaz" - All of which is true. I, thankfully, don't cook for a family, I say thankfully because I don't like to cook, not because I don't like family. Still, many nights I've come home after a movie screening (when I didn't have time to pack a #CinemaSneaknSnack) and I've made pancakes for a late night snack, and with Krusteaz just add water mixes, it'll be delicious and super quick! Below is the little video I made after opening up the box of swag today! I'm not sure why it looks like I'm squinting. I'm not trying to read anything. 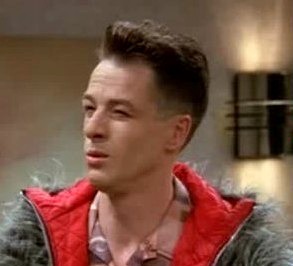 I've got to pay attention to this, cause I've seen other pics of me squinting lately, I'm turning into a French Stewart. In honor of National Hot Breakfast Month in February KRUSTEAZ is giving away: Two boxes each of the following mixes: Buttermilk Pancake Mix, Belgian Waffle Mix, Blueberry Pancake Mix, Wild Blueberry Muffin Mix, and Cinnamon Swirl Crumb Cake Mix. Along with a new whisk, spatula & tote bag. (Sorry, the gift card, pan & molds are gifts for the Blog hosting). POST UPDATE 2.10.17 - If you are among those who enjoy breakfast at dinner, you're not alone. Krusteaz, makers of premium pancake, waffle and baking mixes, released the results of its third annual breakfast survey, a national poll conducted by ORC International, revealing that the "Breakfast Night" trend continues as nine out of 10 Americans say they eat breakfast for dinner. But it's particularly popular with millennials (93%) fire up their griddles for breakfast foods at other unexpected parts of the day, such as lunch and late night snacking. Millennials are 84% more likely then Gen X and Boomers to eat breakfast for lunch and 83% more likely then Gen X and Boomers to enjoy breakfast as a late-night snack. As for topping choices, millennials are also more likely to mix it up. They are more than twice as likely than Boomers to top pancakes and waffles with strawberries, chocolate chips or whipped cream versus the more traditional syrup which is still the most popular topping for pancakes and waffles, selected by 60% of all respondents. And since all good meals are better when you share, it's no surprise that 56% of millennials noted they would share their breakfast for dinner images on social media. If you share yours during February, be sure to hashtag #BreakfastNight and tag @tineseltine or @tinsel_tine (IG).